The Oregon Christian Convention is a place, an event and an idea. The place is 19 acres in Turner, Oregon. The event is the annual week of the “Oregon Christian Convention.” The idea is to connect churches on common ground for the building up of the Body of Christ. The Oregon Christian Convention has been connecting the church in the Northwest for over 160 years. OCC offers conferences, retreats, and seminars throughout the year. These events target areas of ministry in the church to equip the church as it ministers in the local community. The Oregon Christian Convention is a 501(c)(3) non-profit organization dedicated to promoting unity in the Body of Christ. With roots in the Restoration Movement, this ongoing ministry strives to connect the churches of the Northwest by offering occasions for spiritual growth, reunion, refreshment, and discovery. In 1885 the Turner family donated the property that hosts the annual camp meeting known as the Oregon Christian Convention. 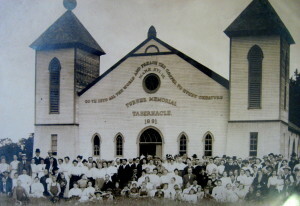 The Tabernacle, which was built in 1891, continues to house the annual event. More history can be found here.